Hensel's Integra monolight range become Integra Plus Freemask, including a triggering system designed to simplify creating clipping masks. 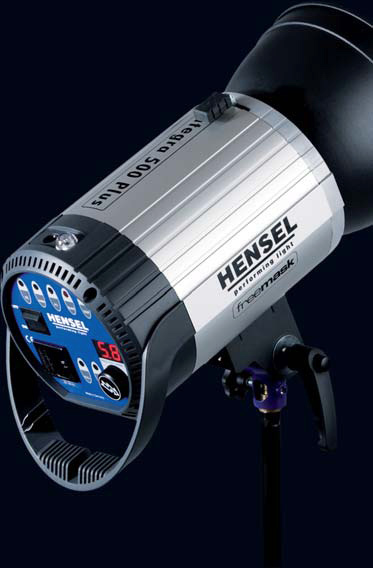 German lighting gear manufacturer Hensel have updated their Integra monolight line to “Integra Plus Freemask”. Their new line offer even more features at the same price point of previous Integra monolights. These new monolights are a fusion between their Expert line (which no longer will be updated) and the Integra line. The result is a monolight with integrated Strobe Wizards (Hensel’s own radio trigger system, also compatible with Profoto Air), the Freemask technology and a powerful 300 Watts modelling light. One of the most interesting points of these new monolights is the Freemask technology. It isn’t a software solution; instead it is a process in which you pre-program the background lights in conjunction with your main and fill to be shot in a high frequency rate. This produces 2 images: one exposed for the subject and one exposed for the background. The second silhouetted image enables easy creation of clipping masks on the computer and swapping in a background of your choice. The idea of this feature is to facilitate separating fine details which can be lost via chroma key or other methods. The Freemask feature works in conjunction with a high FPS camera (e.g. Nikon D3s, Canon EOS 1D MkIV) , the Strobe Wizard radio trigger system and a Hensel monolight with the Freemask designation. You can see examples of this feature here (PDF file in English). The Integra Plus will be available in 250, 500 and 1000 Watt second models, we don´t have a specification list at the time of print but expect them to be similar to other Integra units. As soon as we have more details we will post them.